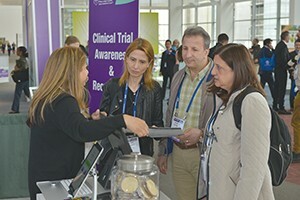 Connect with organizations recruiting investigators for clinical trials and about ongoing clinical trials in the Clinical Trials Awareness Area. Visit the Clinical Trials Awareness Area to learn about clinical trial investigator opportunities and provide feedback on products in development. Four exhibitors in that area welcome your insights and expertise about how to improve and advance patient care. Stop by and see them in the Moscone Center Lobby (North Building, Lower Level). FibroGen, Inc. in Booth 3 is a biotechnology company focused on the development and commercialization of therapeutic agents for serious unmet medical needs. FG3019, an investigational therapeutic antibody that inhibits the activity of connective tissue growth factor, is currently being evaluated in a randomized placebo-controlled Phase 2 trial in idiopathic pulmonary fibrosis. In a previous open-label Phase 2 IPF clinical trial, FG-3019 was found to be safe and well-tolerated, and changes in fibrosis were correlated with changes in pulmonary function. Genentech, Inc. in Booth 6, which is now a member of the Roche Group, has been delivering on the promise of biotechnology for more than 35 years. Genentech, uses human genetic information to discover, develop, manufacture, and commercialize medicines to treat patients with serious or life-threatening medical conditions. Today, they are among the world’s leading biotech companies, with multiple products on the market and a promising development pipeline. Insmed Incorporated in Booth 1 brings its mission to transform the lives of patients battling serious, rare diseases, such as nontuberculous mycobacteria (NTM) to the ATS International Conference. Its CONVERT™ INS-212 study is a clinical research study designed to explore an investigational medication—liposomal amikacin for inhalation—in adult patients with NTM lung infections caused by mycobacterium avium complex and who have not experienced success with previous treatments. Reata Pharmaceuticals in Booth 5 is a clinical-stage biopharmaceutical company located in Irving, Texas. Its focus is to develop drugs that modulate the activity of important regulatory proteins, called transcription factors, to address serious or life-threatening diseases. One of our lead product candidates, bardoxolone methyl, is in Phase 2 clinical development for the treatment of pulmonary arterial hypertension and pulmonary hypertension due to interstitial lung disease.